Planting for butterflies and hummingbirds recently have taken off. 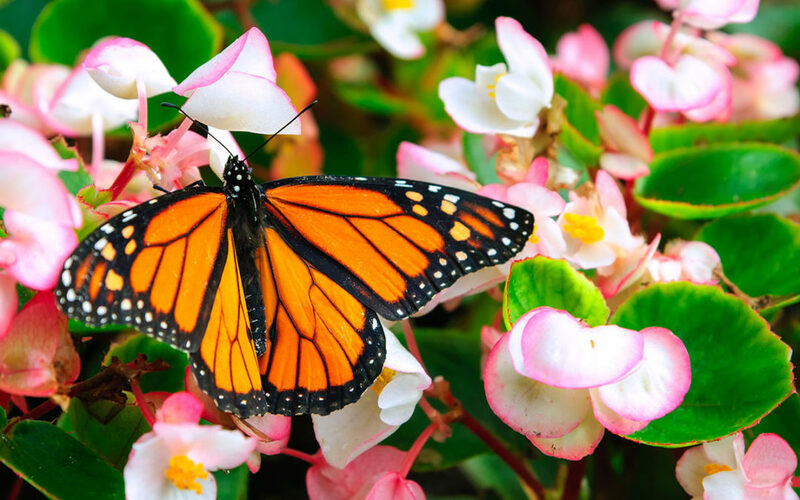 Sure you can attract a couple of butterflies and hummingbirds just by planting a few of the right flowers in the window box or a corner of your landscaped beds. They should have plenty of sun and protection from strong winds. The south and southeast side of your house, wall, hedge or slope are excellent. If you don’t have a sheltered site, arrange the plants in a bowl shape with taller ones on the outside by creating a sheltering effect. You need to plant nectar plants as well as larval food for them. Some nectar plants are – BUDDLEIA (Butterfly bushes), HIBISCUS, LANTANA, VERBENA, PENTAS HONEYSUCKLE, TECOMA, PLUMBAGO, SALVIAS (all types) just to name a few. Some larval plants are DILL, PARSLEY, FENNEL, CARROTS, MILKWEED and CASSIA’S. Each larval food attracts different varieties of butterflies. Before you kill any caterpillars make sure they won’t be a beautiful butterfly. If you don’t like your caterpillars eating your foliage make a safe house so they won’t get killed. Bring them inside on the porch or in a terrarium and keep feeding your caterpillars with what you found them eating on and they will form a chrysalis on a stem or a stick. After 2-3 weeks they will hatch out and become a beautiful butterfly. Hummingbirds are attracted by the same flowers but are a different story. You will need to designate an area with mostly bright flowers that have nectar and put out a hummingbird feeder with sweet water. Change water daily or it could sour in our heat. Then watch for them. The Ruby – Throated Hummingbird is the native bird for this area. Their area is from Florida to Eastern Canada. Very few hummingbirds are in the Midwest. The flight pattern is in a “U” shape with the bird rising about 10 to 15 feet on either side. Size of the hummingbird length is 3.75 inches. Migration – Northward: late February to Mid-May and Southward: late July to late October. Fertilize for continual color for your flowers. Use once a month Sunniland Bloom Special 2-10-10 or Flower-tone by Espoma. Remove old blooms by dead heading the flowers. In some annuals root rot can occur – use Thiomyl as a soil drench to control this problem. In planting flowers do not put mulch near the stem of the plants, put it around them but not touching the plant or root rot could occur. June is the last month to prune and fertilize, because azaleas start setting their blooms after June. Use Bayer Rose & Flower Care with Merit or Systemic Insecticide Granules this will continue to control lace bugs which causes a silvery effect on the leaf appearance but the presence of shiny spots of excrement are found on the undersides of the leaf, is another good indication of lace bugs usually stunt the azaleas and cause early leaf drop. If present on azaleas now, spray with Orthene at least three times a week a part. Check closely on other plants for lace bugs might occur on them also, such as Viburnum odoratissimum or Sycamore Trees. During the summer months worms on Azaleas can be a problem. Spray with Thuricide (BT) or Sevin to control worms or caterpillars. Check dogwoods, pine trees, peaches, apples this time of the year for flat-headed and round-headed borers. They attack in May and early June. For the control of borers spray with Orthene or Permethrin or once a year soil drench with Bayer Tree & Shrub Insect Control. Make 2 to 3 applications 7 to 10 days apart in May and early June. Apply to trunk, crotch of tree, lower limbs and ground particularly to injured areas and old borer holes. Soak bark to runoff and also around base of tree. Do not apply to fruit. Have many different colors now such as: yellow, pink, lavender, red, white and blends of all colors. (A list with prices and varieties are available.) Daylilies like the full sun, at least 6 hours is good. The flower of the daylily lasts only one day. Avoid soggy soils, they like well drained sandy soil like we have in Florida. Amend the soil with Peat Humus to help hold the nutrients from fertilizer. Apply fertilizer such as Sunniland 2-10-10 Bloom Special, Bone Meal or Espoma Flower Tone out from the lily leaf spread. Daylilies are generally pest free. However, some may have aphids and thrips and should be treated with Orthene. Water daylilies often when they are blooming. Mulch can be used but keep from crown of the daylily. DAYLILY ALERT on RUST – rust on daylilies is very contagious to other daylilies. If present – rust can kill your plants. Prune infected leaves down to the ground. Dip clippers in a bleach water solution (2 tbsp. per gallon of water). Clean out any dead foliage that is on the ground around the daylily. Use Daconil fungicide and spray at least 3 times, 7-10 days apart. Throw away all leaves and debris in a plastic bag and tie it up for the garbage truck. Chinch bugs and mole crickets can be a problem this time of year. Apply Arena, Bifen (Talstar), Orthene, Sevin, Permethrin (Permetrol) or Imidacloprid to control these bugs. Lawns in shady areas need to be fertilized more frequently because grass relies on the fertilizer to grow and not the sun. Also the tree depletes the fertilizer too. Pursley Seville is proven to grow well in the shady spots. Weeds can still be a problem in your lawn but weed & feeds Should Not be applied because it is too hot. Agra Lawn Crabgrass Killer or Baking Soda can be used anytime and as spot weeder for certain weeds. Hi-Yeild Crabgrass Control or Dimension can be applied now to work on the weed seed. Hi-Yeild Crabgrass Control also works on clover, spurge, goose grass, Johnson grass from preventing the weed seed from germinating in your lawn during the summer months. Now is the time to control nutgrass (nutsedge). In St. Augustine or Bahia use Sedge Hammer Plus. Use a Make two applications according to time on maintenance schedule for St. Augustine or Bahia grass. MAY & JUNE is the month to check for powdery mildew on many plants. Such as roses, vegetables, crape myrtles, hydrangeas, laurel oak trees and dogwood trees just to name a few are proved to be infected. This is a fungal disease which occurs in Florida during spring. The disease is enhanced by frequent rains, heavy dew in the mornings, cool mornings in the 50 or 60 degree range, high humidity and temperatures above 80 degrees Fahrenheit. Powdery mildew is characterized by white powdery growth, masses of spores on young leaves, shoots and flower buds. Foliage may be distorted and shoots stunted or swollen. Flower buds will come out more slowly. These spores of powdery mildew are not spread by splashing water but are windborne. They germinate under conditions of relatively high humidity. A spray that can be used on everything is Liquid Ornamental and Vegetable Fungicide which contains Daconil or Neutral Copper Fungicide. Continue to spray for spider mites and aphids -the drier the weather; the worse it can be – use Orthene. If Beetles are present use Sevin Dust. Cut open damaged blooms so the beetles can’t hide anywhere. Spray for black spots as well use Thiomyl, Daconil or Dithane M-45. Roses are very hungry plants fertilize once a month with Espoma Rose Tone or Bayer Rose & Flower Systemic Food. This will last longer during our rainy season. BULBS: AMARYLLIS, AMAZON LILIES, BLOOD LILIES, CALADIUMS, CALLA LILIES,CANNAS, CRINUM LILY, DANCING GINGER LILIES,ELEPHANT EARS, GLADIOLUS, GLORIOSA LILY, PINE CONE GINGER LILY, RAIN LILIES. FLOWERS: (S=FULL SUN; SH=SHADE; SS=SEMI-SHADE): AGERATUM-S,SS; AMARANTHUS (SUMMER POINSETTIA)-S; ASTERS-S,SS; BABYSBREATH – S,SS; BEGONIAS-SS; BROWELLIA-SS,SH; CELOSIA -S; CLEOME-S,SS; COSMOS-S; DAHLIA-S,SS; DALBURG DAISY-S; GAILLARDIA-S; GERBERA DAISY-S; IMPATIENS-SH; LISIANTHUS-S,SS; LOBELIA-SS,SH; MARIGOLDS-S,SH; PERIWINKLES-S,SS; PORTULACA-S; PURSLANE-S; RUDBECKIA ( BLACK-EYED SUSAN)-S; SALVIA-S,SS; SUNFLOWERS-S; TORENIA (WISHBONE FLOWER)-SS,SH; VERBENA-S,SS; ZINNIA-S. HERBS: BASIL; CATNIP; DILL; FENNEL; LAVENDER; MINTS; OREGANO; PARSLEY; ROSEMARY; SAGE; SWEET MARJORAM; SUMMER SAVORY; TERRAGON; THYME. VEGETABLES: OKRA; PEAS (BLACK EYED); TOMATO (CHERRY, PATIO OR ROMA); SWEET POTATOES.